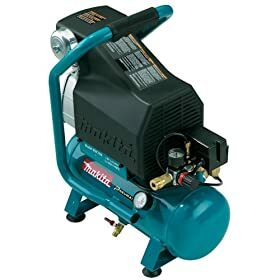 This one’s a bit of a paradox: The do-it-yourselfer might pass by this compressor in favor of an oil-free, no-maintenance model, but it’s actually one of the best on the market for the homeowner, hobbyist and weekend warrior. There are three factors that made us form this opinion. First, it’s the quietest compressor we’ve ever encountered. It’s a remarkable departure in a genre of tools that normally force you to suspend conversation while it’s cycling. The MAC700 puts out 80 decibels, according to the folks at Makita, and when you compare that to the 90 and up you get from most units, that’s practically a hum. So we like this for household use, especially in a basement shop. Next on our list of pluses for the DIY-er is the low-amp draw, and with that, fewer trips to the breaker box and less chance of premature motor failure. The other feature that won us over is the easy-on-the-hand lever handle ball valve that saves your knuckles when you drain the tank. It’s also got a really fast cycle, so by the time you take a sip of water, you’re ready to work again.